This traditional grasshopper pull toy is inspired by a toy we saw at a folk art museum in Oaxaca, Mexico. Garth did a quick sketch at the museum and when we returned home we came up with this design. The wheels power the articulated legs to move up and down. When in motion, the grasshopper's wooden legs extend and contract to make a pleasant clacking sound. 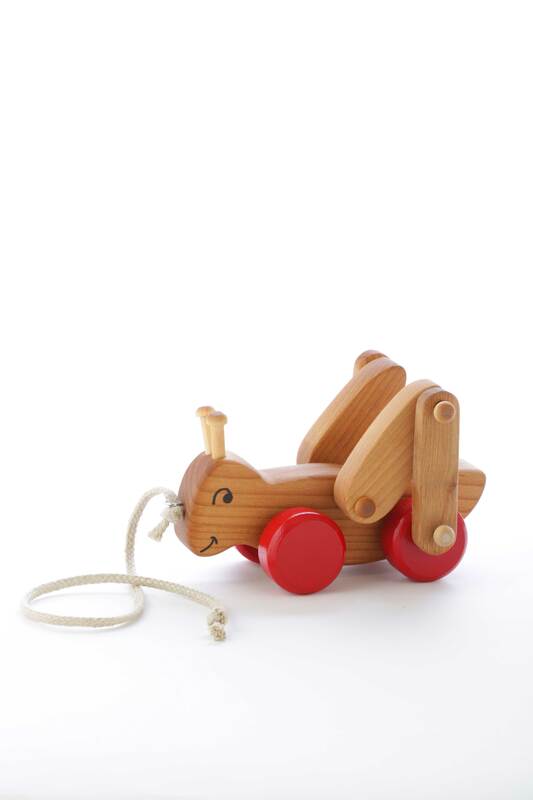 We make this toy of locally-harvested Oregon alder and finish it with food-grade mineral oil. The colored wheels are painted with non-toxic paint. Finished with non-toxic paints and food-grade mineral oil. Choose Red, Yellow, Blue, or Green Wheels. Organic hemp pull cord is 20" long. Handcrafted in Oregon, USA. Ages 1 - 4. My daughter has been running in circles around the house pulling this little guy behind her, laughing the whole time. The craftsmanship is excellent - definitely an heirloom quality toy! Click the button below to add the Grasshopper Pull Toy to your wish list.